Individuals, organizations, companies and corporations can collectively make a huge difference when they take part in Handing HOPE’s Lollipop Tree Project. This heartfelt initiative aims to stop the sugar and bring smiles to children battling cancer nationwide. This project brings naturally sweetened lollipops to children after chemotherapy treatments. Research is showing the negative correlation between sugar and cancer. These lollipops provide a guilt free way for parents and medical staff to help relieve that yucky taste and mouth sores that accompany treatment. Every $1 donated brings 5 smiles to children battling cancer. Handing Hope is a 501c3 with the mission to create a movement where people choose to kick the chemicals, stop the sugar and utilize valuable resources to reduce the risk of cancer. We desire to inspire and educate those in the battle, the survivors and those looking for prevention. Cancer is an epidemic. We know knowledge is power and sharing HOPE makes a difference. We are able to do this through our many programs. There is not a person on the planet, when faced with cancer, who does not need hope. When they do, we want to be there to support them through their journey. WHEN YOU SUPPORT THE LOLLIPOP TREE PROJECT, YOUR GENEROSITY BRINGS SMILES TO CHILDREN ALL OVER THE NATION BATTLING CANCER. Sponsor two new lollipop tree locations of your choice from our waiting list. This sponsorship will also keep these trees watered and full of lollipops all year long, bringing 50,000 smiles to kids with cancer. Sponsors will receive a personalized Giving Circle Print and two tree toppers with their logo to display on their trees. Additionally, Platinum Circle sponsors will be given a check presentation photo opportunity, website recognition, and a “thank you” social media post mentioning the sponsor on Facebook, Twitter, and Instagram. 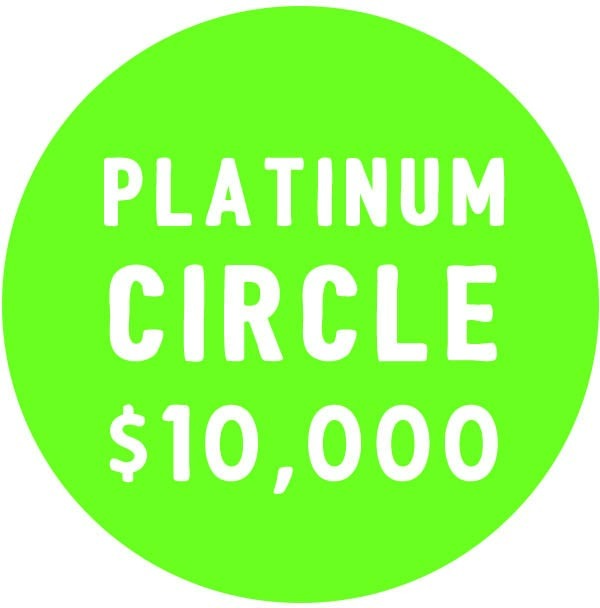 But we won’t stop there, Platinum Circle sponsors will receive a short “sponsor spotlight” or blog, featuring information about that business or organization. This sponsorship tier offers businesses and organizations many additional benefits. Enjoy a personalized experience with team Handing HOPE. Our team members will come to your location and invite your employees to assemble the trees and join them in a team building workshop, providing ample opportunities for photos to be taken. 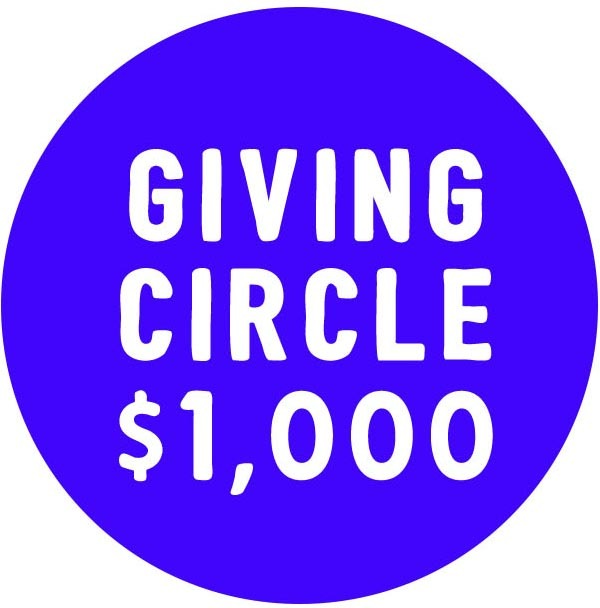 Platinum Circle sponsors will also be able to join us at upcoming Handing HOPE volunteer events as well as receive branding recognition at events hosted by Handing Hope in the calendar year of donation. 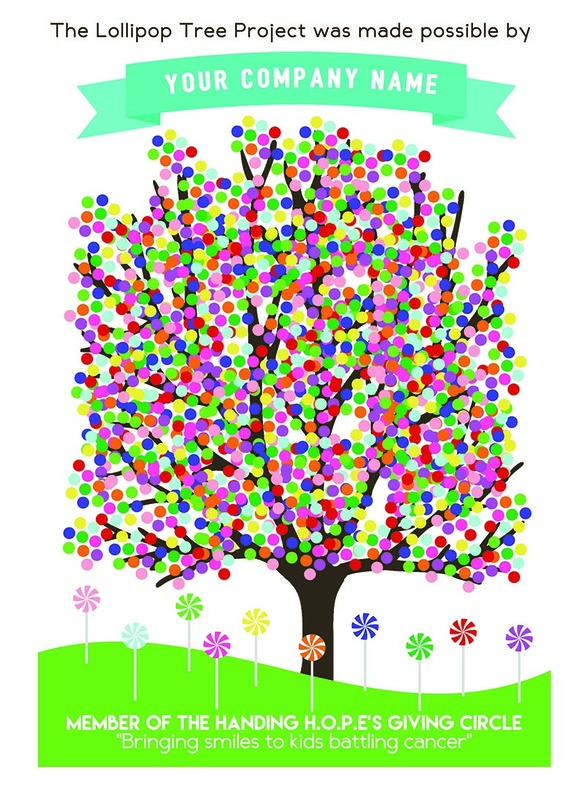 Sponsor a lollipop tree in a new location! This sponsorship will not only plant a tree in a children’s hospital but also keep it watered all year long. You will be bringing smiles to 25,000 children in the cancer battle. Gold Circle sponsors will receive a personalized Giving Circle Print and a personalized tree topper with their logo on top of their newly planted tree. 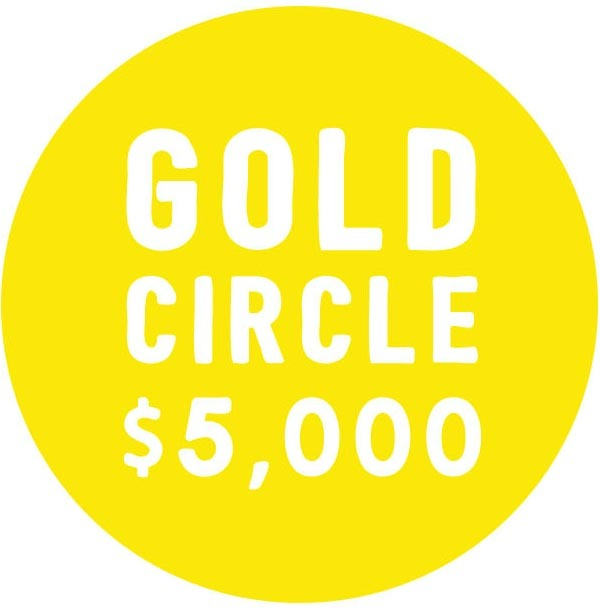 Additionally, Gold Circle sponsors will be given a check presentation photo opportunity, website recognition, and a “thank you” social media posts mentioning the sponsor on Facebook, Twitter, and Instagram, as well a short “sponsor spotlight” post or blog, featuring information about that business or organization. Gold sponsors will also be able to join us at upcoming Handing HOPE volunteer events for team building and personalized experiences with those supported through Handing HOPE’s mission. Bring 5,000 smiles to kids in the cancer battle by keeping our existing lollipop trees “watered” and full! Sponsor will receive a personalized Giving Circle Print and website recognition. In addition, a “thank you” social media post mentioning the sponsor will be made on Facebook, Twitter, and Instagram. YES, I'M READY TO DONATE!